you have the most obscur posts i've ever read!! it's fantastic! P.S. who was the women ms. miller deticated her book to and how where they connected/related? You're the first person to ask. Do you want to know the truth, or would you like a good story? OK, check back tomorrow at noon. One good story coming up? The truth, of course.... and a good story as well, because if they're both believable someone hopeful can pick. Yeah,i read about that. 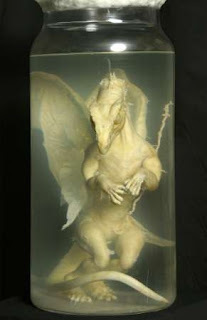 he kept a rubber dragon in a jar of formaldehyde.